Did you know that there are water apps to keep track of your H20 intake? We all know that drinking lots of water has multiple health benefits, such as more energy, better digestion, weight loss, and clearer skin. But chugging eight full glasses of water a day is easier said than done. To get your recommended H20 intake, incorporate these little tricks into your daily routine. Bottoms up, CGs! Shop for an eco-friendly reusable water bottle that suits your lifestyle and taste. Choose the perfect color, design, size, and functionality. Do you prefer a tumbler where you can draw your own sleeve design? How about one that comes with a filter? Want the sporty kind that you can attach to your bag? Would you like a cute straw to go with that? Invest like you’re buying your first designer bag. The more time you spend choosing or customizing your bottle, the more likely you’ll make it part of your daily routine. 3. Download a water app. Yes, there’s a free app for that! Download iPhone and Android apps such as Waterlogged and Daily Water to help you keep track of your daily water intake and remind you when you’re not getting enough. Aside from chugging down glasses of water, you can get your dose of hydration from water-rich foods such as melon, watermelon, cucumber, celery, and lettuce. Having a bowl of broth with your usual lunch or dinner meals can also increase your fill. Take it from fancy restaurants and your Pinterest-obsessed friends: add life to your boring glass of water with slices of lemon, orange, basil, tea leaves, and other varieties of fruit and veggies. 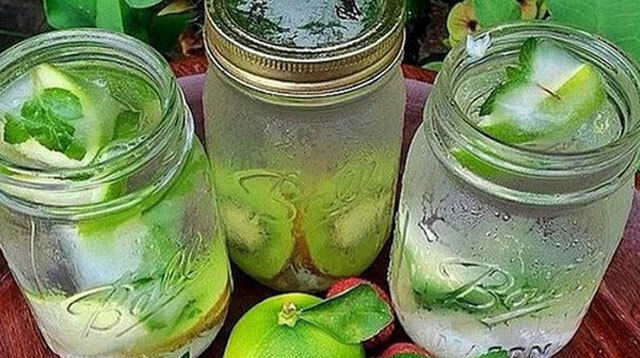 Get creative with fruit-infused water recipes online. They’re fun and easy to follow! You may even serve it in a mason jar to make it Instagram-worthy. 6. Make it part of your daily habits. Train yourself to have a glass of water after completing specific daily tasks, such as brushing your teeth, fixing your bed in the morning, or taking a bath. 7. Count calories and cash. Each time you crave for a soda or other calorie-laden drinks, have a glass of water instead. Using your planner or iPhone’s notepad, jot down the sweet drinks you were supposed to have that day. At the end of the week, calculate the total number of calories of the drinks you were supposed to have. Then calculate the total amount of cash you would’ve spent had you ordered those drinks. Seeing how much money and calories you saved will motivate you to keep up this water habit. Visit Kate on KateWasHere.com and follow her on Instagram andTwitter.